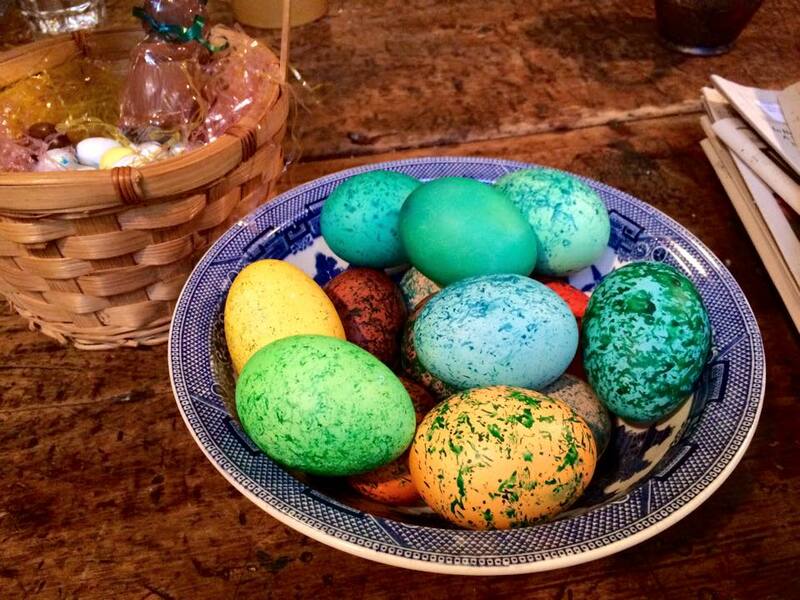 This year, we decided to do something different and made speckled Easter eggs (via Martha Stewart Living). Very easy, very pretty, and very kid-friendly. Start with dry hardboiled eggs–either dyed your usual way or left white or brown. Prepare small plastic or paper cups (we used empty yogurt containers) with about 1/2″ of dried beans or seeds; we used popcorn kernels (un-popped). Add a few drops of food color to the cups and gently shake eggs one at a time around in the kernels. If it dries out, add a tiny amount of vinegar to refresh it. Let dry on a wire rack. We used fake food coloring, but I think it’d be nice with natural color such as made from beets.